The specialist in natural and organic foods has become a colossus in the industry, but has faced hard times lately. The movement toward greater food-quality awareness has never been stronger, and natural and organic foods specialist Whole Foods Market (NASDAQ:WFM) has proven to have been forward-thinking with its business model. For decades, Whole Foods has pioneered the natural and organic niche, challenging conventional grocery stores and finding ways to demonstrate the value of the products it offers. Yet more recently, the company has run into hard times, and Whole Foods stock has suffered as a result. Many investors wonder if the grocer will ever return to its stratospheric growth, given rising competition and some corporate concerns. Let's take a look at how Whole Foods stock has performed throughout its history, and see whether the company is poised for even more gains in the future. As you can see in the chart above, Whole Foods has had a long and varied stock history. In its nearly 25-year history as a publicly traded stock, Whole Foods has delivered an average annual total return of more than 14%, and that has produced gains of more than 2,400% along the way. Yet Whole Foods has clearly gone through its ups and downs. During the 1990s, the grocer enjoyed great success, feeding off the strong U.S. economy and giving food shoppers with additional disposable income a higher-quality alternative to the traditional grocery store. 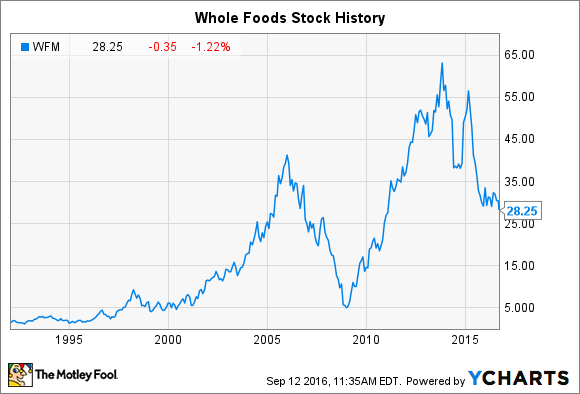 Even when the tech bubble burst in the early 2000s, Whole Foods still managed to hold its own, and it took advantage of the subsequent recovery to post impressive gains. The first challenge for Whole Foods stock came in 2006, when high-growth investors came to grips with the idea that the pace of the company's revenue gains might need to slow down. Before then, comparable-store sales for Whole Foods locations routinely posted double-digit percentage gains. What investors needed to come to terms with was the idea that single-digit comps growth might be the norm for a maturing grocery chain, and that helped set the stage for a significant pullback. Moreover, the housing bust and financial crisis made many people question whether shoppers would continue paying up for premium food items. Yet as the subsequent turnaround revealed, Whole Foods maintained greater customer loyalty than many investors expected, and that helped send the stock to new heights in the early 2010s. Since late 2013, Whole Foods shares have lost more than half of their value, and the reason came from a new direction: the traditional-grocer market. Rather than cede the natural and organic market to Whole Foods and a host of smaller competitors, grocery chains decided to answer with high-quality food offerings of their own. In particular, Kroger (NYSE:KR) led a drive toward greater availability of organic and other premium-quality products in its stores, and it offered cheaper prices than Whole Foods. As a result, the organic specialist had an unappetizing decision: to give up market share, or cut prices and suffer the resulting drop in profit-margin figures. Despite hoping it had found a solution to the problem in 2015, Whole Foods has subsequently gone through more tough times. Allegations of improper weighing of food items hurt Whole Foods' reputation, and changing demographics and customer preferences led the grocer to introduce the new 365 store concept earlier this year. It's too early to tell whether the 365 move will be a success, but even if it is, the chain's focus on more competitive pricing is bad news for those who had hoped that high-margin sales from legacy namesake Whole Foods Market locations would last forever. Where does Whole Foods go from here? Whole Foods hopes to drive traffic through a combination of new methods. The 365 stores have the potential to draw in a brand new set of customers who haven't shopped at Whole Foods locations before. Continuing efforts to maintain food quality are essential to its long-term success. In addition, a new Whole Foods loyalty program could give customers incentives to find bargains and shop at stores more frequently. The question is whether Whole Foods will spend more on promotions through the program than it makes back through higher customer volume. Bringing in new traffic is useful, but if it alienates the higher-end customers who were more willing to pay for the premium Whole Foods experience, then the strategy could end up backfiring on the company. Whole Foods stock has given long-term investors lucrative returns, but shareholders have seen even greater gains evaporate over the past couple of years. Whole Foods faces a turning point in its history, and for its stock to keep rising, it will need to find a strategic vision that resonates both with existing customers and with those walking in the door for the first time.